Norman Keith Collins is better known as "Sailor Jerry" in the tattoo business. He was born in Reno, Nevada, January 14, 1911. By the 1920s he was sailing the Great Lakes, traveling the United States and tattooing by hand on the side. During those sailor years Collins met tattooist Tatts Thomas in Chicago and said that he was his first teacher in electric tattooing. 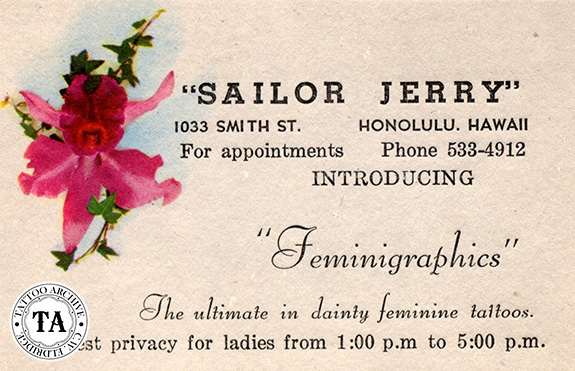 Sailor Jerry’s business card from this period showed him at #434 South State Street and included a rubber stamped address for #150 North Hotel Street in Honolulu. For a workingman's tattoo shop in an era where acetate stencils were king, Jerry would make rubs from his new designs and mail them out to his friends. This was a popular way for an artist to exchange design ideas. Sailor Jerry died June 12, 1973 and is buried at the National Memorial Cemetery of the Pacific, (commonly known as the "Punchbowl") in Honolulu, Hawaii. This cemetery is located in the crater of an extinct volcano. 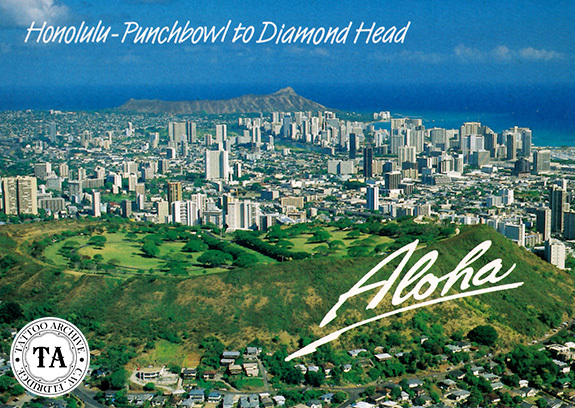 The site of Jerry's grave is 124/Section T. If you happen to find yourself in Honolulu, stop by to say hello. For more information on the Sailor Jerry story see one of the many Hardy Marks publications about him.